Retail trade magazine The Grocer recently asked us to rethink the typical supermarket bread aisle. Sitting around our studio table, we brainstormed the typical bread aisle and talked through the latest trends in the world of bread and in-store bakery. We observed that whilst retailers have been trialling new in-store bakery formats, the bread area of stores still largely comprises shelves and shelves of sliced loaves. So, we decided to inject some much-needed theatre into the aisle through a variety of functional showpieces that would celebrate the process of bread-making and the delicious end result. The Bakery School is a hands-on creative space where groups of customers can learn how to make bread and other baked goods. The ‘glass box’ design allows those who are not participating in a class to still learn about the process by looking in. It is intended to get customers excited about bread, and about the wonderful variety on offer. 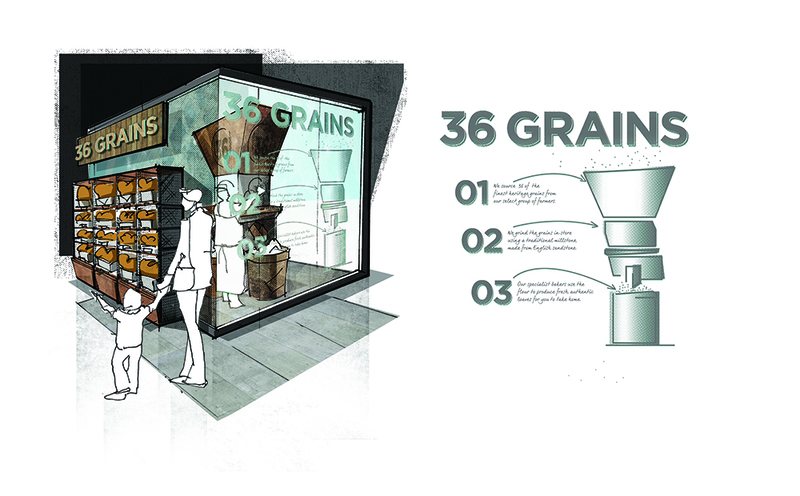 Our ’36 Grains’ concept showcases another part of the bread production process – this time at the beginning i.e. the milling of the flour. This taps interest in ancient/ alternative grains. Retailers can sell the flour to the public and also make loaves using the different flours, to sell as a premium product. 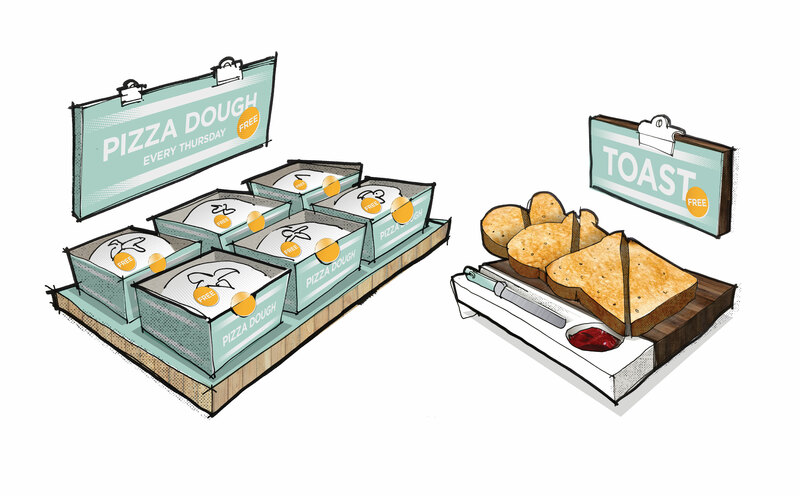 We have also suggested an interactive area where retailers can offer for free, or sell, fresh pizza dough – the idea being that shoppers will buy toppings for and accompaniments to their pizza in the store. The restriction of the dough’s availability to just one day e.g. ‘pizza Thursday’ should help build anticipation amongst shoppers, providing a refreshing antidote to the modern expectation of shopping being available anywhere, anytime. Meanwhile, the ‘toast station’ allows consumers to try before they buy, toast being one of the most comforting foods there is. This should help forge an emotional connection between retailer and consumer. It also allows for cross-selling opportunities with jams, butters etc. 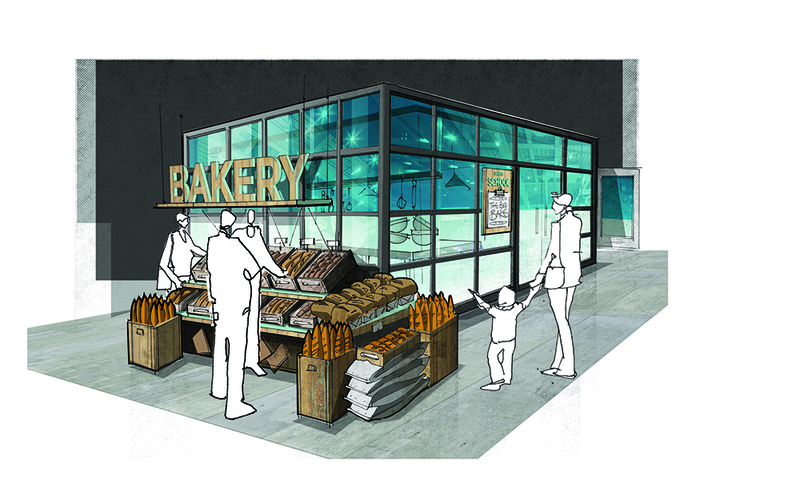 We hope the introduction of such theatre and experiential retailing would have a positive, halo effect on the rest of the bread category, by drawing people into the aisle and getting them baking, tasting, thinking more about bread and most importantly – getting them buying.